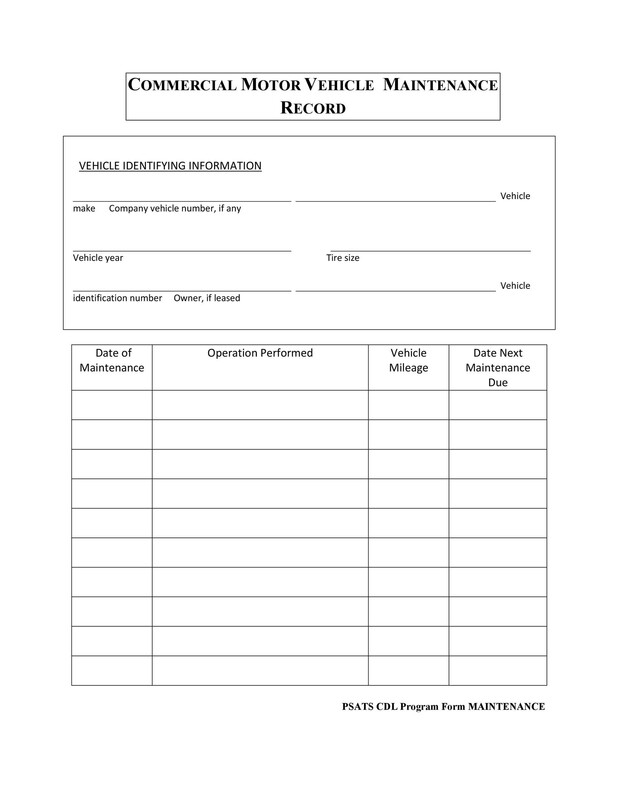 You can use a vehicle maintenance log to monitor the repairs of your vehicle. 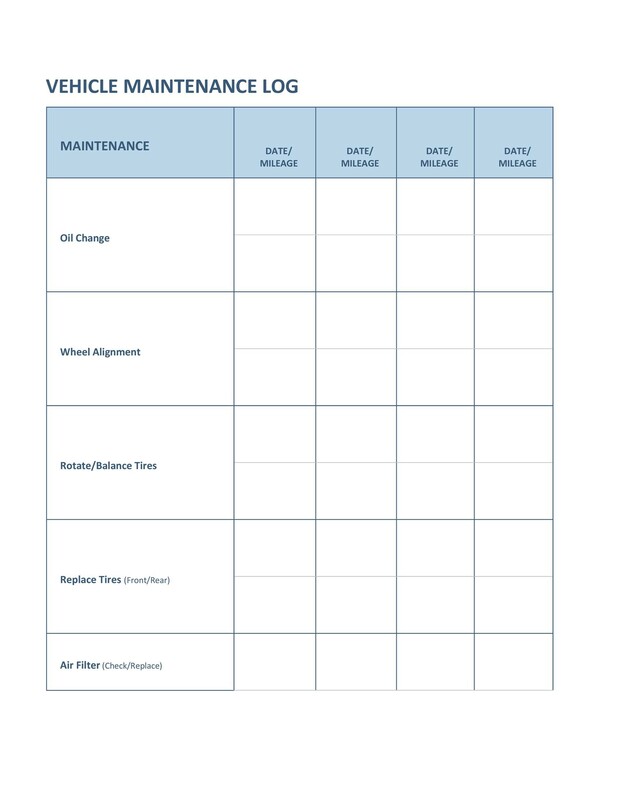 You can also use it to schedule the maintenance of your car. 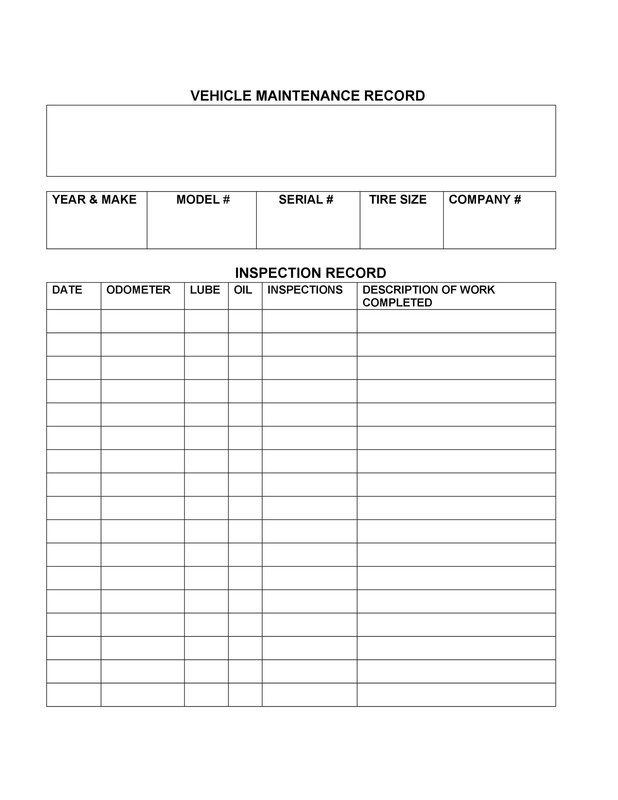 This record is also known as a car maintenance log, auto maintenance log or even a truck maintenance log. 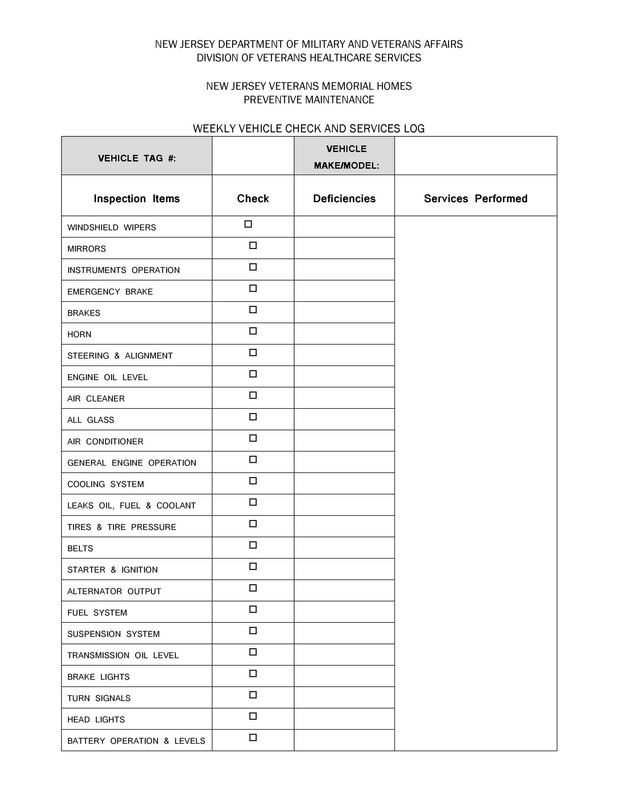 When it comes to your vehicle, you don’t need to have it inspected each time you use it. But you do need to have it serviced regularly. 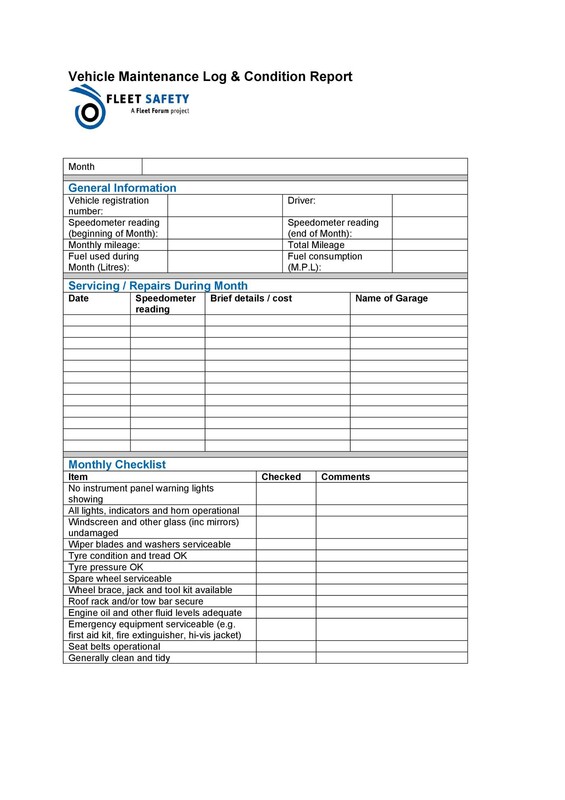 6 How do you keep your vehicle maintenance log? 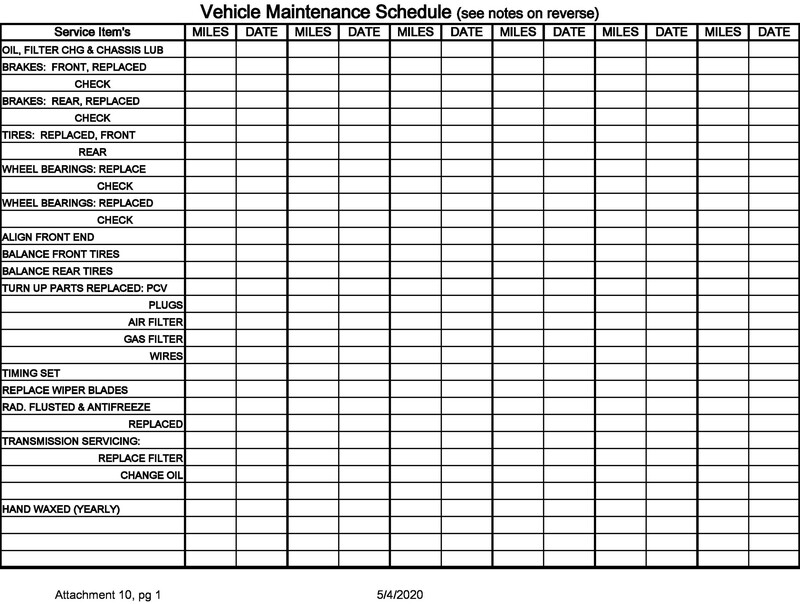 8 What do you need to do to maintain your vehicle? 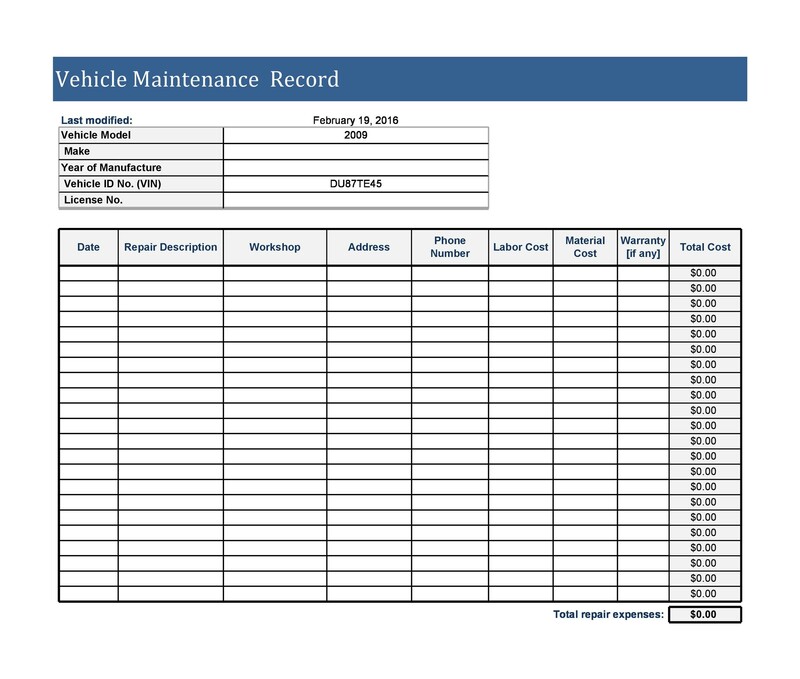 Keeping a log of your vehicle’s maintenance is important. In fact, different industries also use this type of log. It’s especially important for industries who use trucks and others for their business. As such, all their vehicles need to be in tip-top shape to ensure the safety of their drivers. 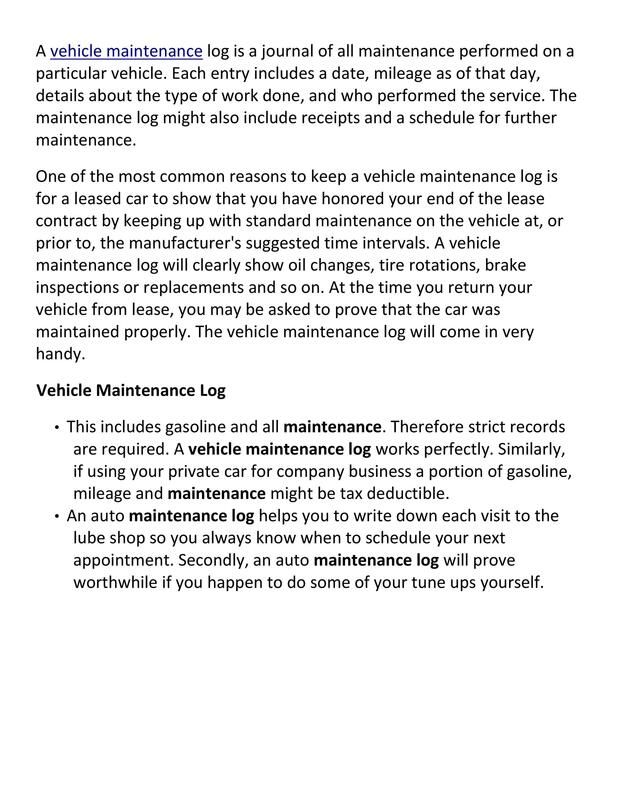 No matter what the situation is, you’ll benefit a lot from keeping a log for your vehicles. You may have already tried keeping one kind of log in your life. 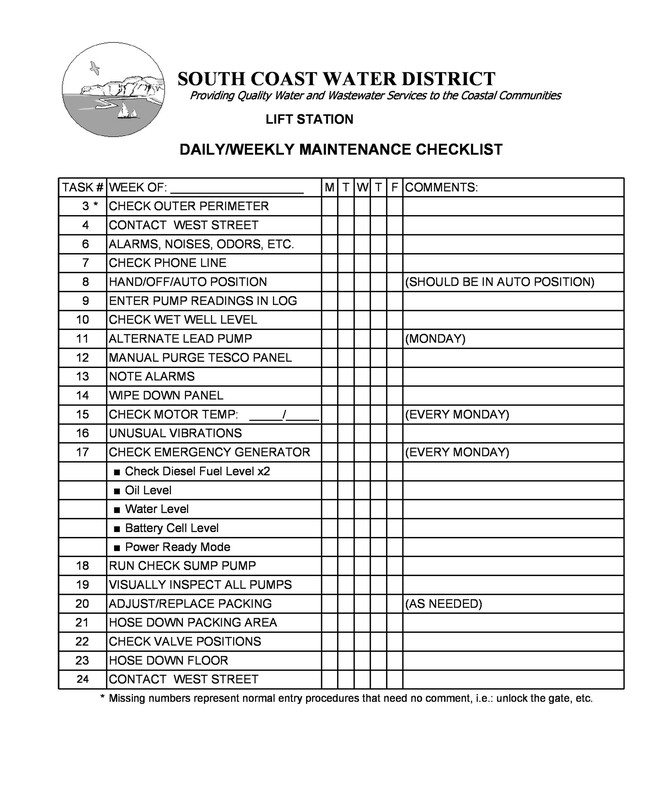 If you have, you’ll know that keeping track of maintenance would help be very helpful. 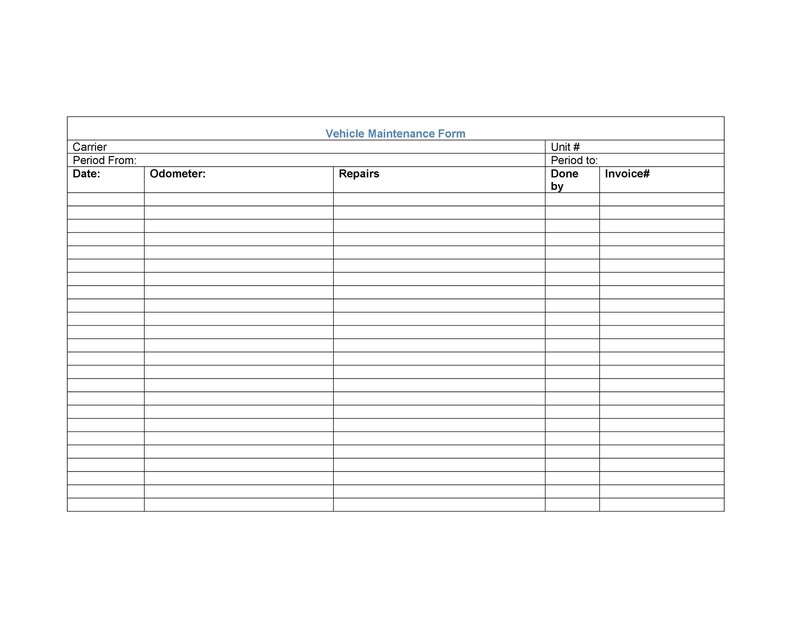 Use an equipment maintenance log to keep track of your equipment’s functionality. 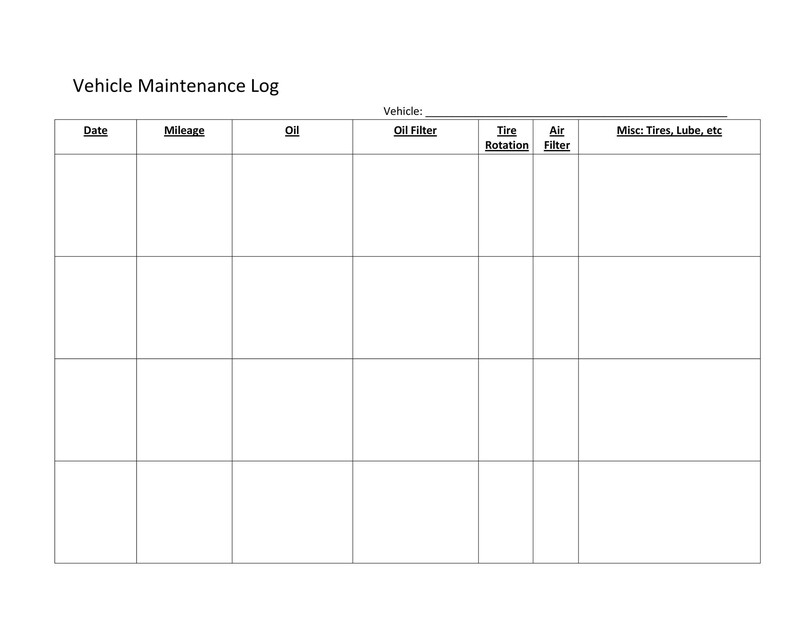 You can use a car maintenance log to monitor the health of your car and so on. You should also include the repair records. These are especially important if your vehicle underwent some extensive maintenance. 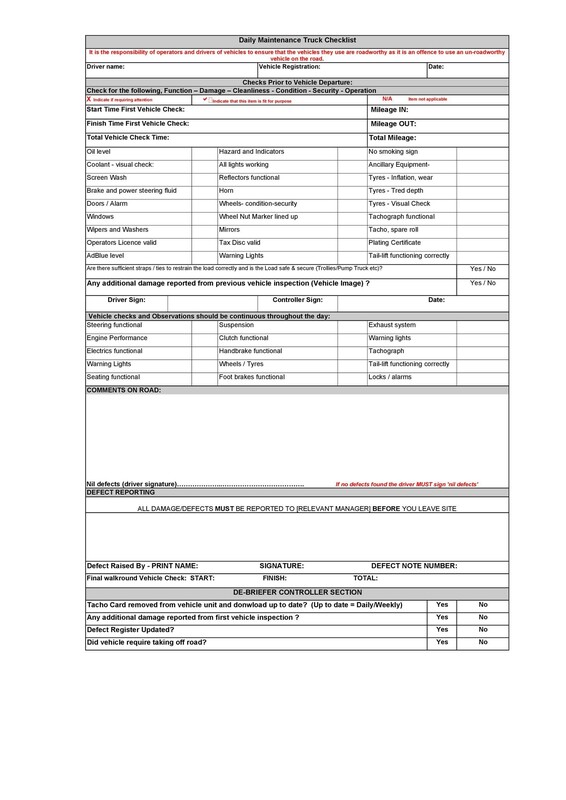 If you’re making your own template, you can add as much information as you want. Just make sure you include these basics so you don’t miss anything when performing a check. Personal and professional vehicles need regular maintenance. Of course, the former needs less servicing than the latter. 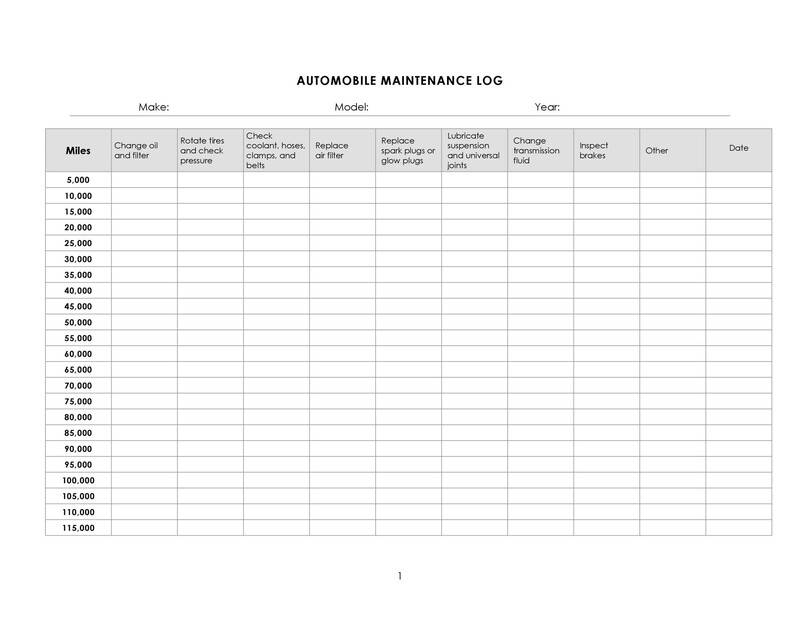 Auto maintenance logs are very useful in different situations. Like if you have a taxi operation service. You need to perform regular checks and maintenance of the vehicles. 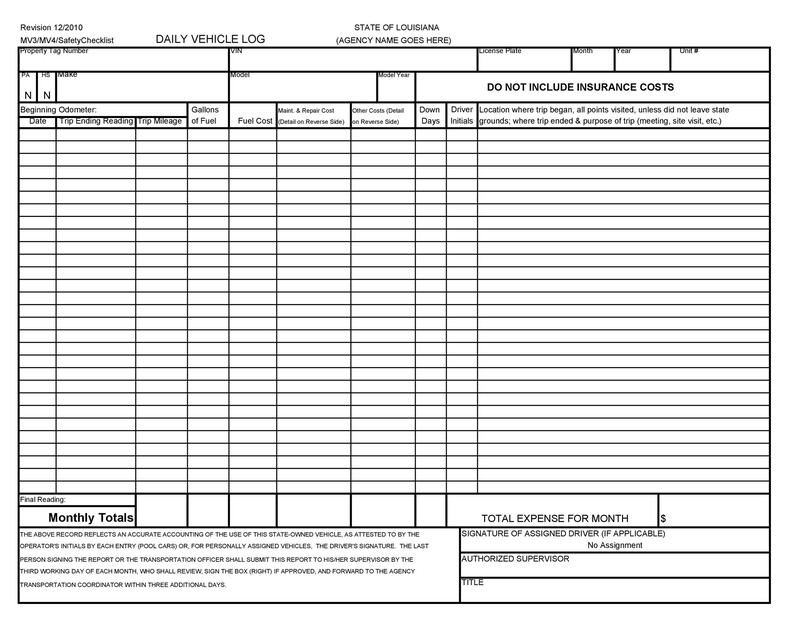 If you sell used cars, you need to keep records of mileage and odometer readings in your log. This is crucial as buyers would want to know this information. There are some situations when regular maintenance is crucial for your safety. Like if you’re a member of an emergency response unit, you need to make sure your vehicle is running properly. 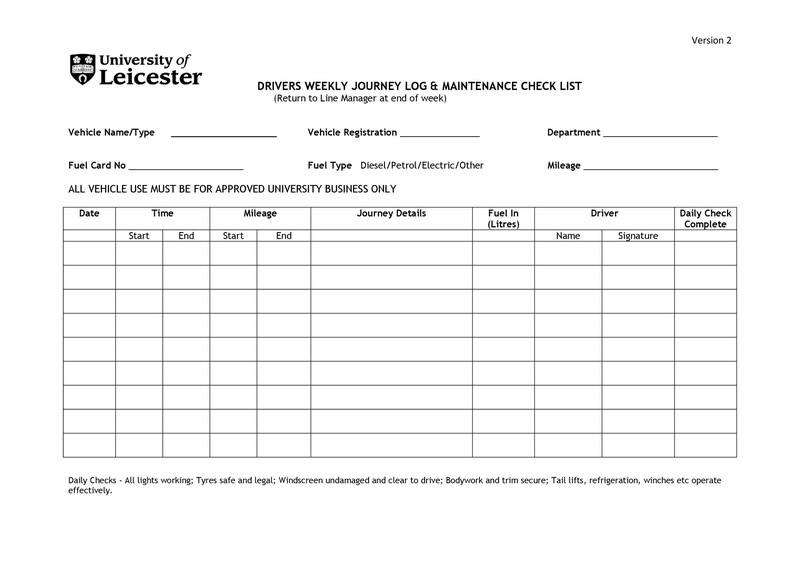 Before you use a vehicle, check the log to make sure that it underwent regular servicing. 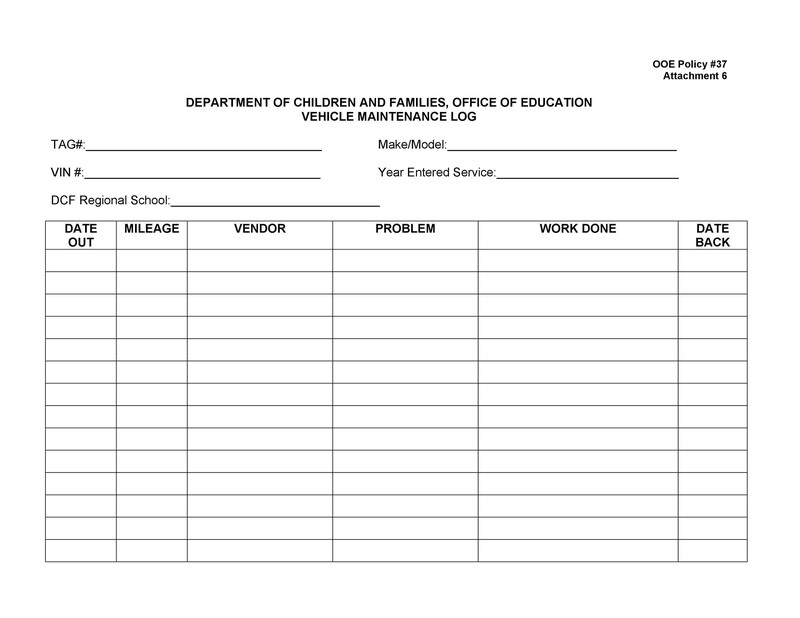 How do you keep your vehicle maintenance log? 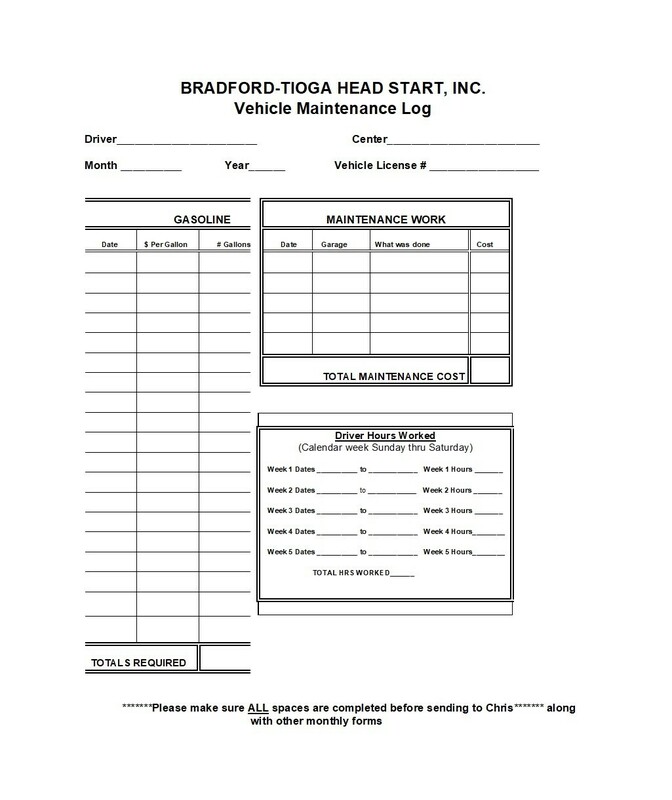 Keeping a car maintenance log or a truck maintenance log is highly beneficial. This is especially true for vehicles used in professional settings. In such cases, the vehicles would require regular maintenance. 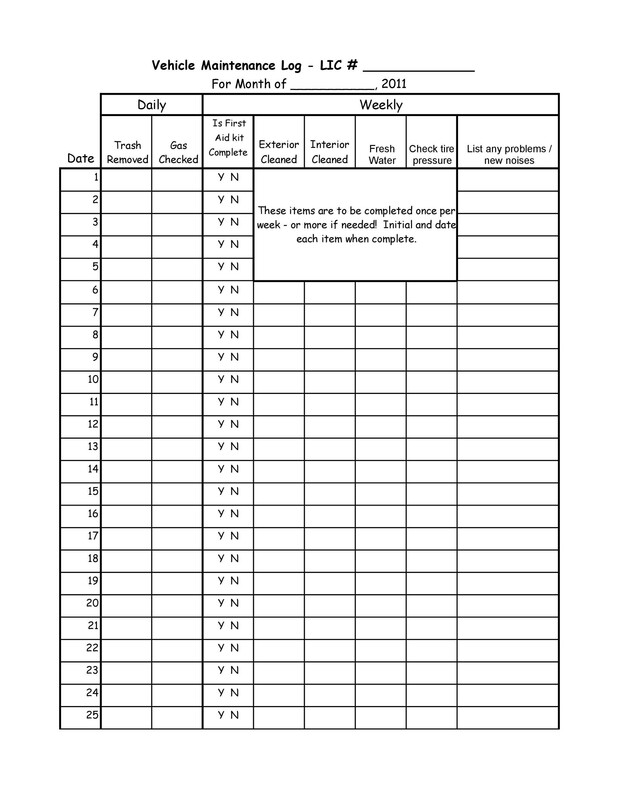 Recording everything on the log will keep everyone in the organization informed. 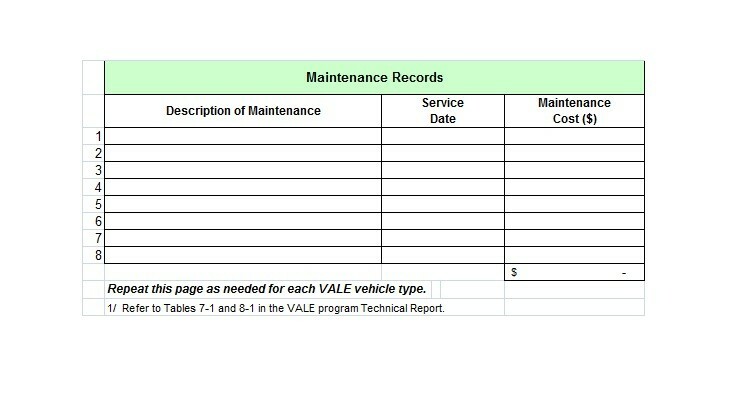 The person in charge of the vehicles will be able to keep track of the maintenance for each of the vehicles. 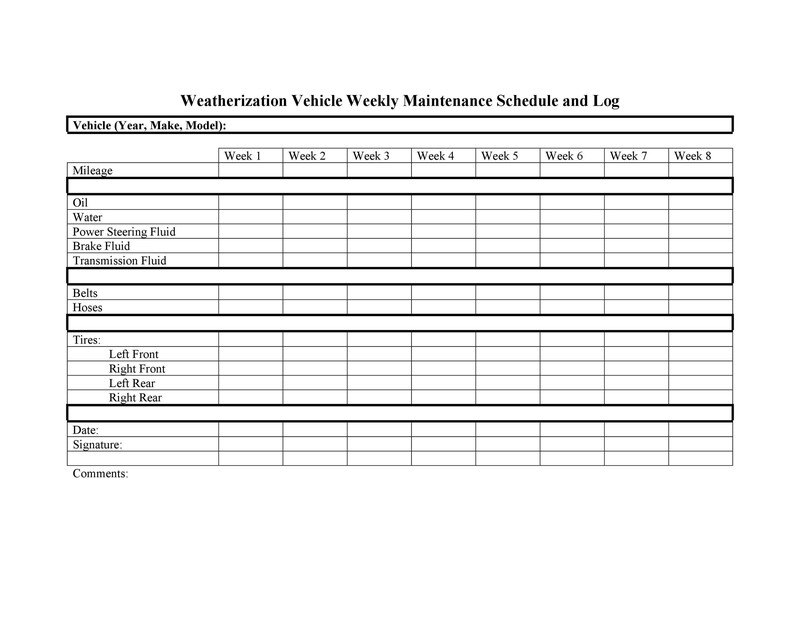 If you keep a log and stick to your schedule, this would ensure that your vehicles will remain in good condition. If you plan to sell them, the log may also improve their resale values. Finally, using such a log would serve as your reminder. 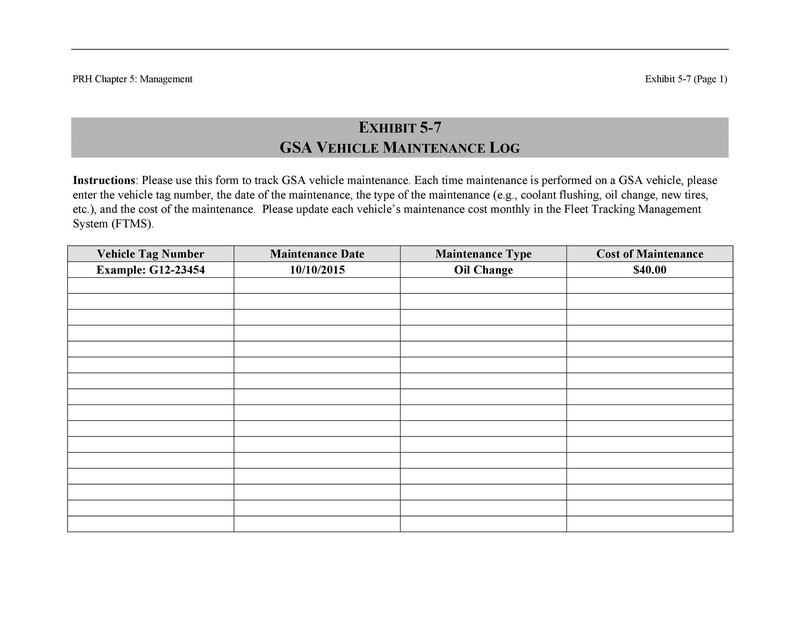 It can help remind you when you need to send your vehicles for maintenance checks. 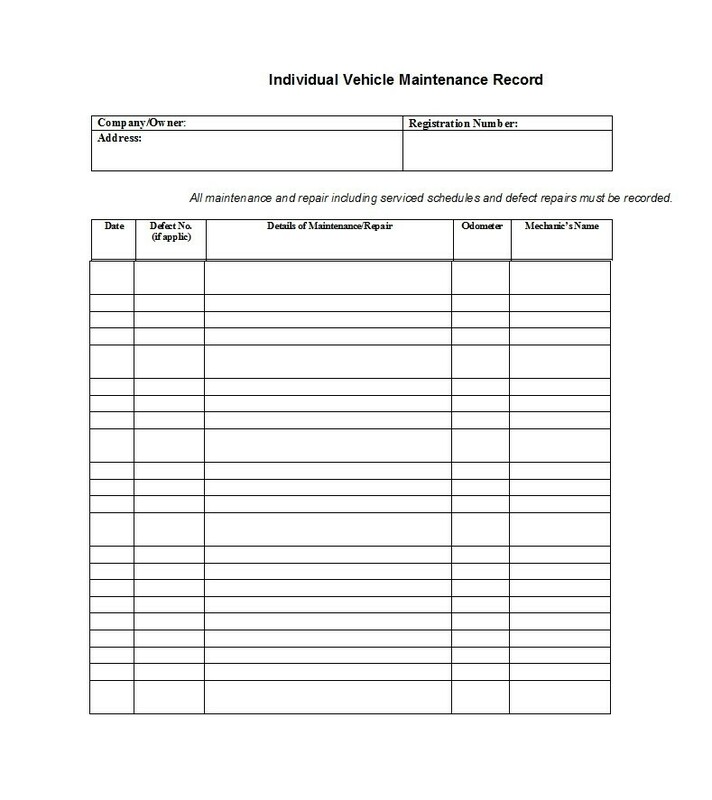 But how do you keep as auto maintenance log? In fact, there are 2 main ways you can keep such a log. First, you can keep a notebook and use it as your log. This is the traditional way to do so. 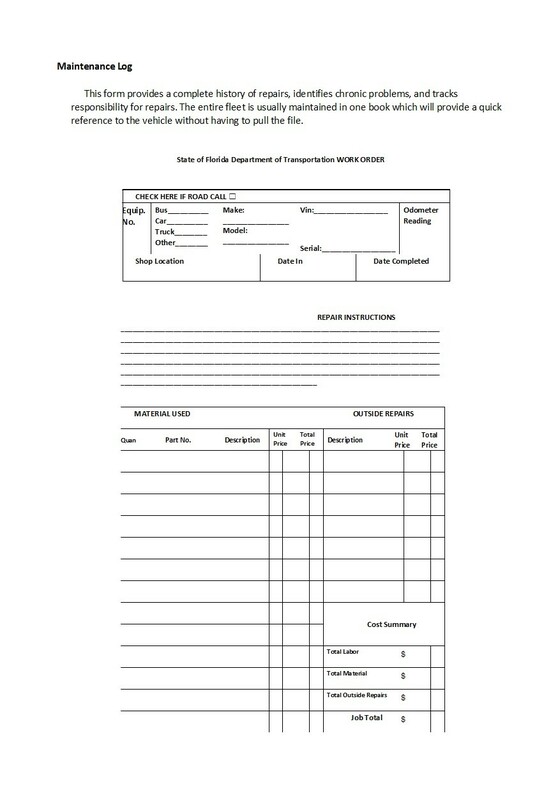 You can even design pages for your log and print them out. Either that or download the templates here and use them. If you print out pages, just bind them together to create a notebook. On the notebook, write down all the relevant information. 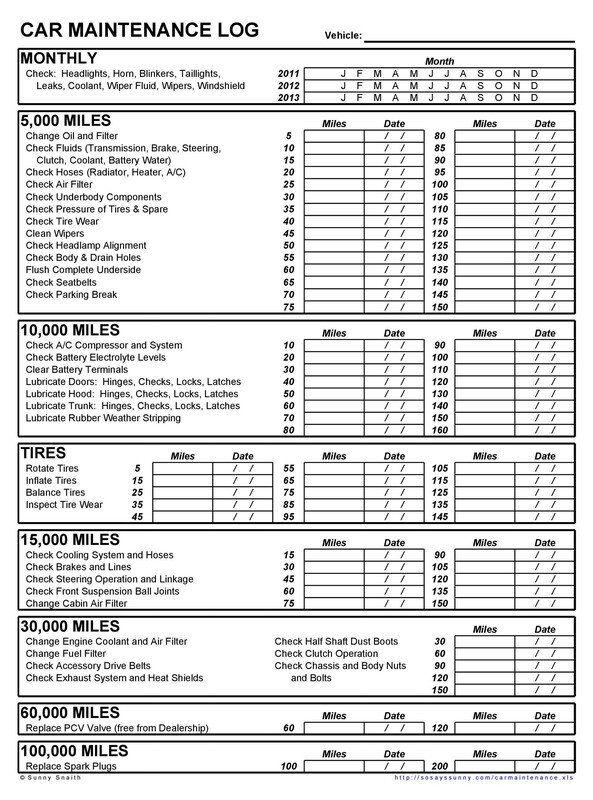 Also, include all service or maintenance schedules you’ve planned for your vehicle. 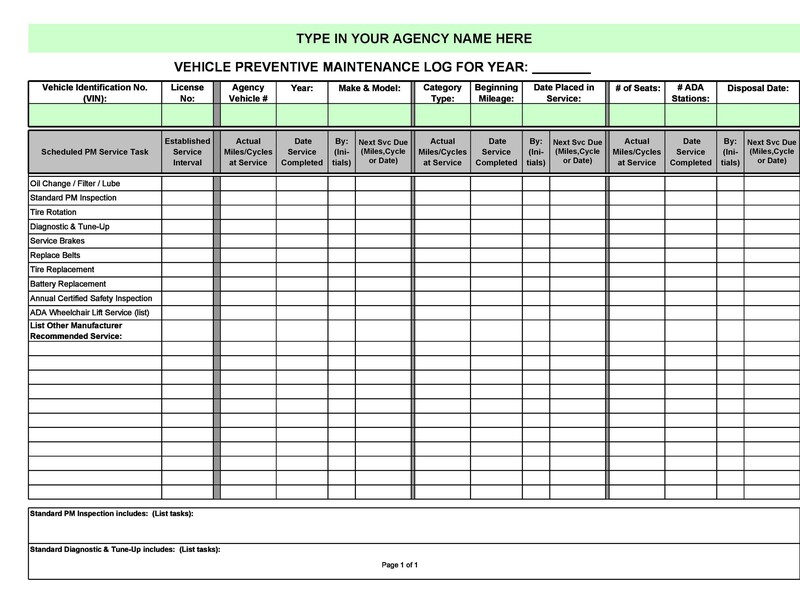 The second way to keep a log is by using car maintenance software. When writing down inputs on your log, include all the important details. These include the details of the insurance policy, car’s identification number, and more. Always keep track of the mileage you get from your auto. It’s best to write down all the dates when you have your tank filled. Also, write down the number of gallons you’ve filled your tank with. 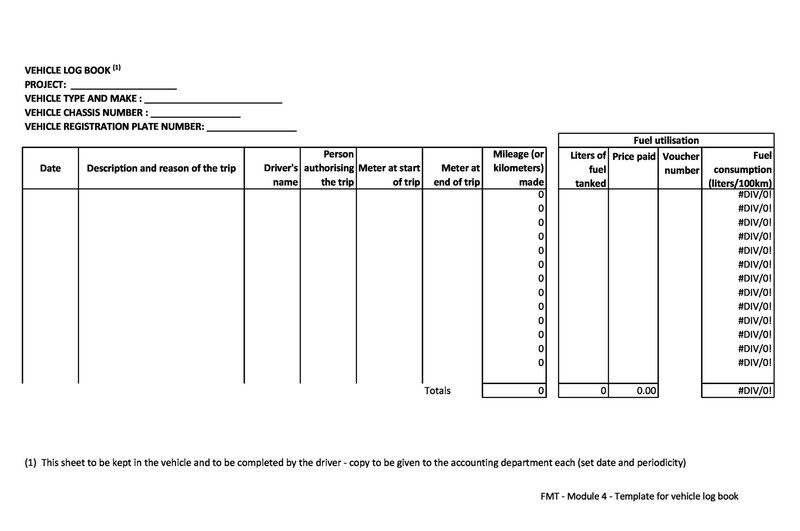 In doing this, you can calculate your mileage the next time you have your tank refilled. 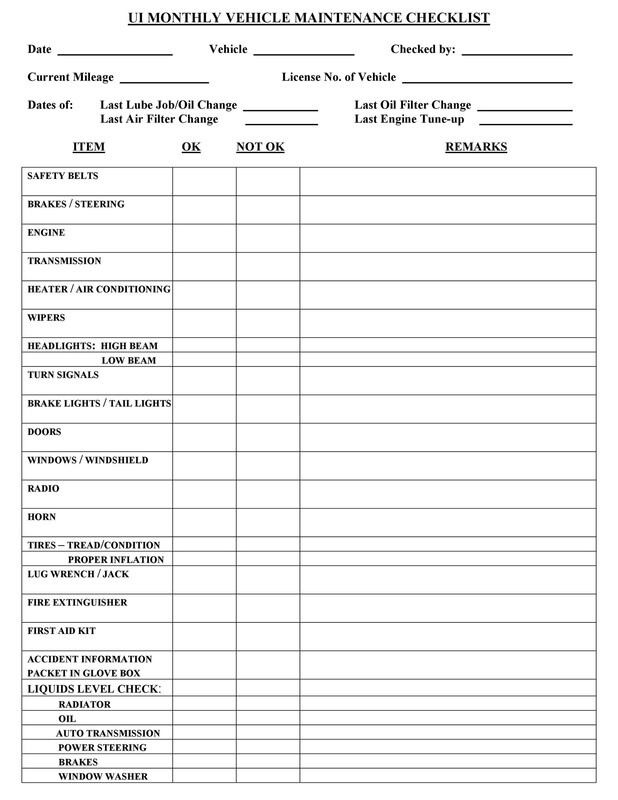 Make a note of the last time you had an oil change as well as the type of oil you used. 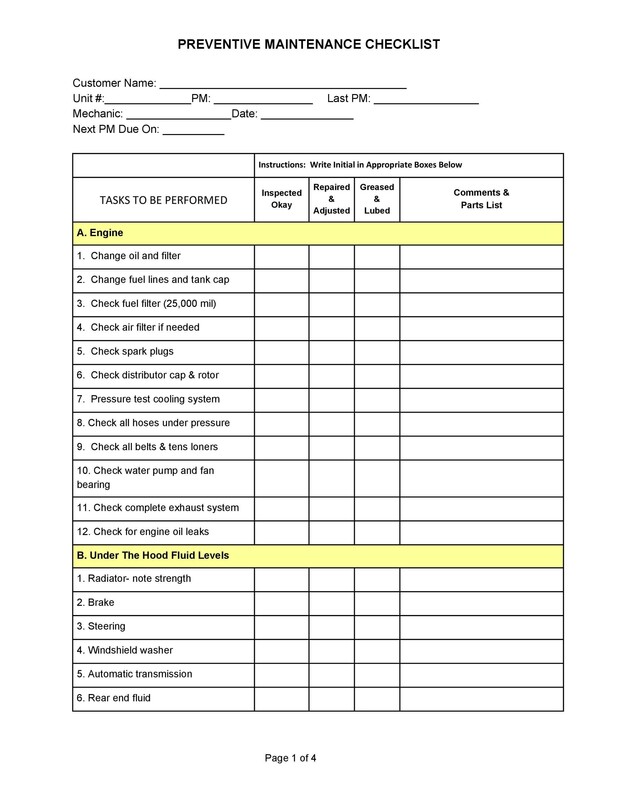 Make a note of reminders to get your brakes checked and your air filters changed. 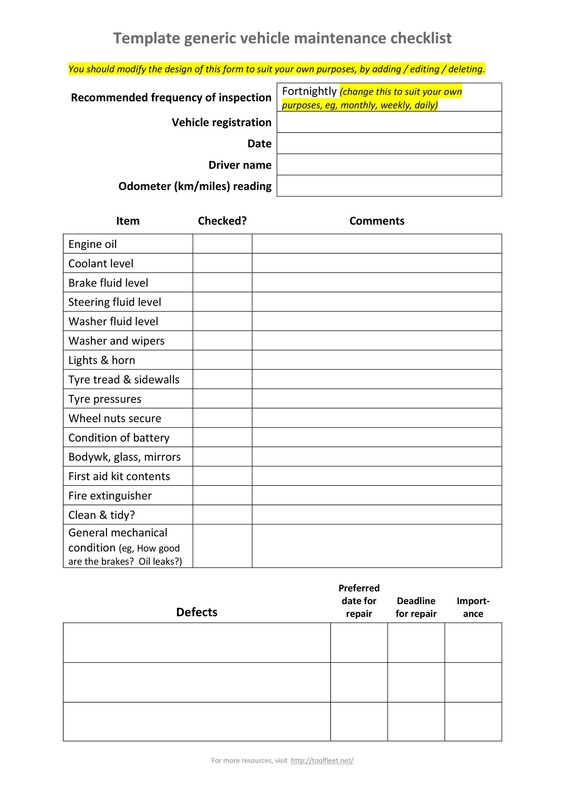 When you start keeping a log, inspect your vehicle and write down all the details. These include the type and condition of your tires, the mileage, and more. 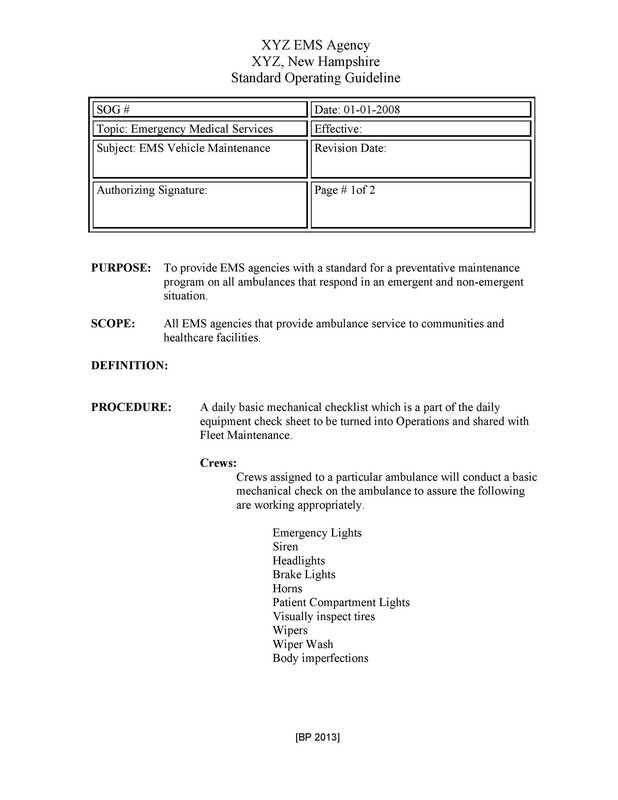 Finally, if you’ve been in an accident, write down all the details in your log too. 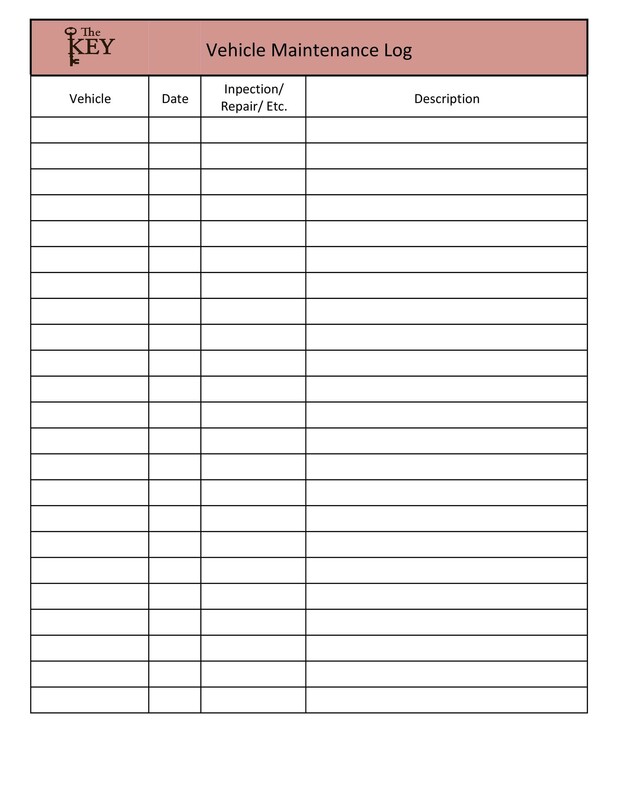 Make a note of all the damages, the cost of repairs, and any replacement parts. Keep the file handy and in good condition always. 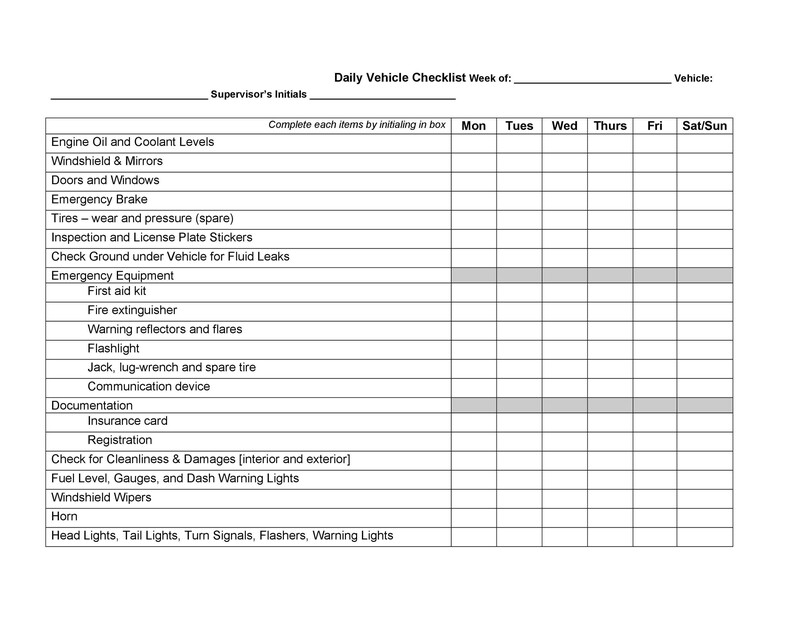 What do you need to do to maintain your vehicle? Regularly maintaining your vehicle is the best way for you to prevent deterioration. 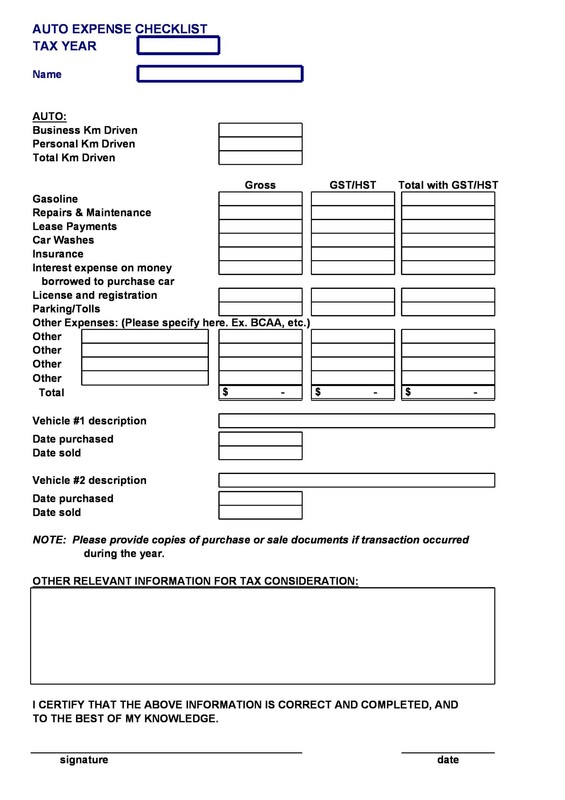 If you’re a car owner, having regular checks and keeping a lot will be very beneficial. Good maintenance will save you a lot of money and ensure your safety while using your vehicle. 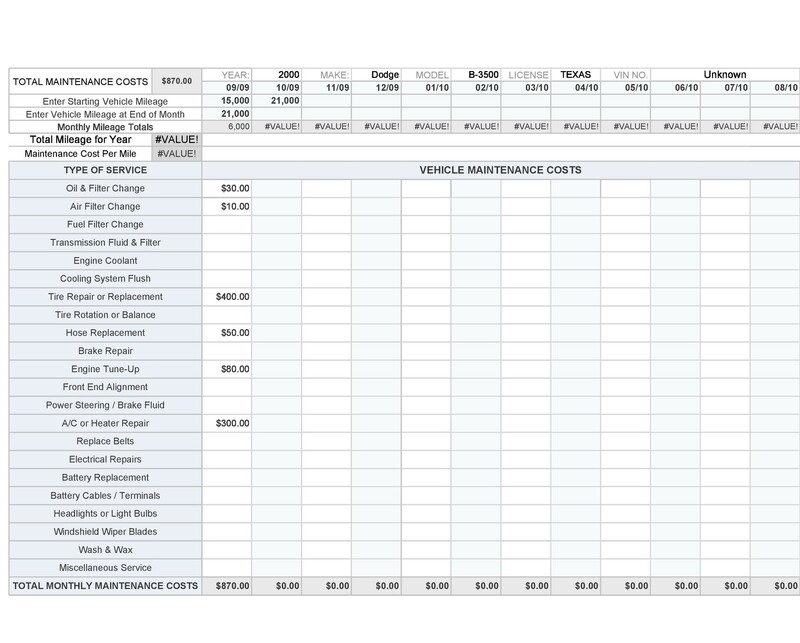 If you’ve already tried working on cars, you’ll know that repairs can cost a lot of money. That’s why it’s better to perform preventive maintenance to catch issues early on. Just like you, your car needs regular check-ups. If you purchased a new car, it will come with an owner’s manual. It will contain the recommended maintenance schedule. Manufacturers include helpful information on the manual. This includes how often you should change the oil, the filters, timing belts, and more. You’ll also know what kind of oil to use to keep your vehicle running. Although a lot of people ignore manuals, with vehicles, that isn’t very wise. Read the owner’s manual so you know exactly how to use your new car. Of course, you would already know how to drive the car. But learning all about the vehicle is also crucial. You can only do this by comprehensively reading the manual. Experienced car users know that car repairs can cost a lot of money. The sad thing is, you could have done more to prevent the problems in the first place. Preventive maintenance is one of the best things you can do to save yourself a lot of money. You may not feel it right away, but this will be good for you in the long-run. 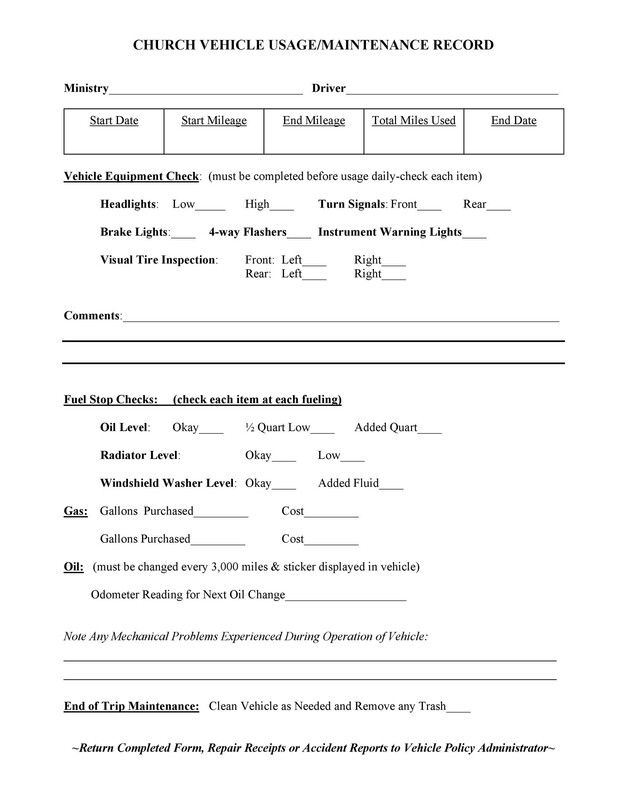 You should also learn how to perform an inspection of your own vehicle. 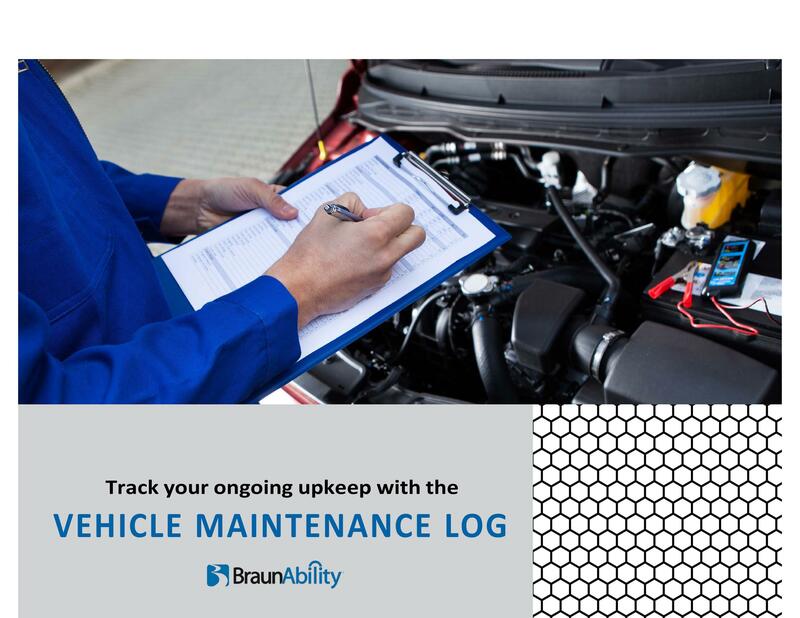 Whenever you do so, make sure to note all your findings in your car maintenance log. This is a basic procedure you can do at any time. Checking your car will allow you to discover anything that’s out of the ordinary. It’s quite easy to perform a check yourself. Check your lights, your tires’ air pressure, your car’s mileage, and more. You can even check if your car is making any odd sounds. If you discover anything strange, bring your vehicle to the shop immediately. You may not know how to change your car’s fluids but you should at least learn how to check them. Sometimes you can see the fluid’s level directly. But in some cases, there are dipsticks or gauges you can pull out. Do this so you can check the levels. 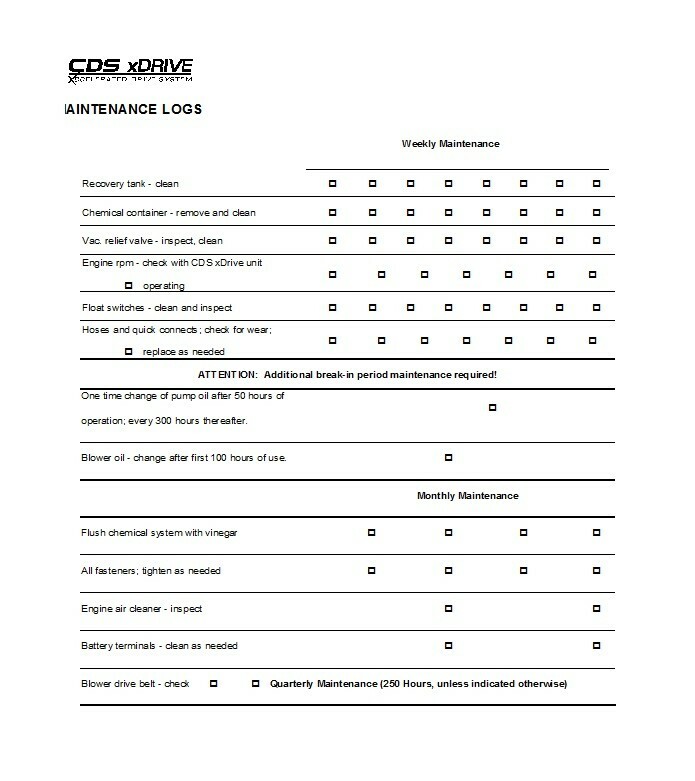 Again, go through your vehicle’s manual to find out how you can check the different fluid levels. When you see that your car’s running low on fluids, add more or have the tanks filled. If you see any leaks, have your vehicle checked immediately. It’s important for every car owner to know how to check the oil. You should know how to differentiate clean oil from muddy or murky oil. Knowing this will save you a lot of money. This will also give you an idea if something’s wrong with your car’s engine. There are no standard rules when it comes to the frequency of oil changes. But you can find this information on your car’s owner manual. This is why it’s essential to read through the manual thoroughly. These days, most batteries don’t need much maintenance. However, it’s still important to know where your car’s battery is. It’s also important to know how to check your battery. Once in a while, you need to inspect the battery to make sure there aren’t any leaks. Also, examine the contacts to see if there’s any buildup. If you find anything, clean it off using a battery cleaning brush. You can find such a tool at department stores or auto part stores. Purchase one and always keep it in your car’s trunk in case you need to use it. While you’re at it, you can also purchase a battery tester. There are certain parts of the car you may have to replace regularly. First, you need to replace your windshield wipers. Do this especially when they make streaks on your windshield. It may seem irrelevant but you should remember that visibility is key when driving. Wipers are actually quite cheap and it’s easy to replace them. So when you notice that they aren’t working well anymore, purchase a pair and change them yourself. Another thing you should replace is your vehicle’s cabin air filter. This task is one of the easiest to do which will make your car more comfortable. The cabin air filter is easily accessible in most car models. So you won’t have any problems when replacing it. Also, learn how to replace your auto’s engine air filter. Doing this is a bit more challenging, depending on the type of car you have. But changing it regularly is very important. 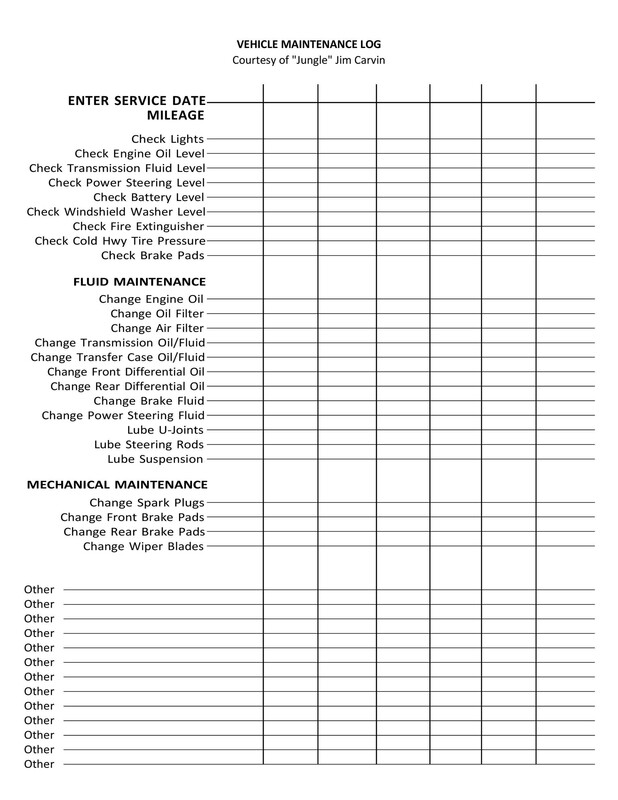 Check your owner’s manual to see how frequently you should change the engine auto filter. 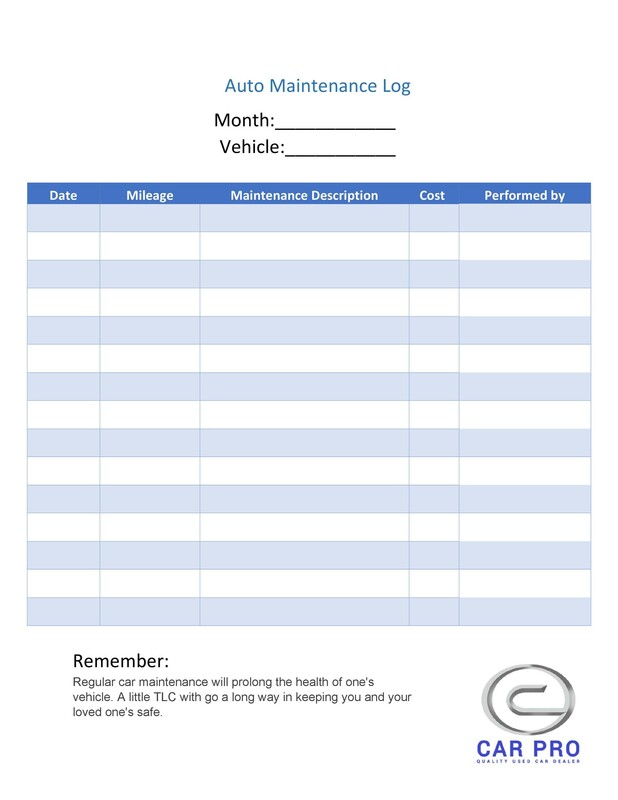 Make a note of it on your auto maintenance log so you won’t forget. Again, check your owner’s manual. It will contain information on how often you should have these checked. This is an important part of preventive maintenance. You need to make sure your car’s tires wear evenly to ensure that it drives smoothly. Having your tires rotated and balanced will help them last a lot longer. The alignment is important too. As time goes by, the spark plugs may get worn out or get covered in buildup. When this happens, your engine won’t work as efficiently. This may also lead to your car’s eventual breakdown. Fortunately, checking and changing your spark plugs is also a fairly easy task. But if you don’t want to change them yourself, you can always go to your mechanic.